Climb the Kilimanjaro with our experienced guides during your vacation, group trip or private trip and experience a unique safari. 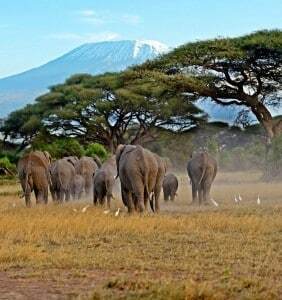 During this safari you drive by bus or car to the foot of Kilimanjaro. You have the possibility to walk to the first hut, this is a nice and relatively easy walk through the tropical rainforest that is located at the foot of the mountain. Here you can spot various monkeys (black and white colobus monkeys), tropical birds and other animals. You can also visit a small waterfall. This walk takes about five hours in total. 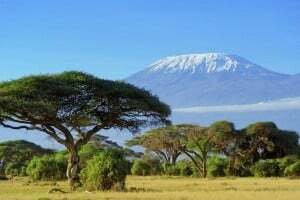 The Kilimanjaro is 19,341 ft high and thus the highest mountain in the continent of Africa. The top of the mountain is covered with snow and ice. This is also the only place where ice and snow is found in Africa. The mountain consists of three extinct volcanoes namely; Kibo Peak with a height of 5,985 meters, Mawenzi Peak with 16893 ft of altitude and Shira Peak at 12999 ft. Climbing the mountain will take you through five different landscapes. The climb starts with tropical rainforest where you can see a variety of tropical birds and monkeys, including the black and white colobus monkey. Then you walk through a savanna landscape, followed by ‘alpine moorland’, a so-called moon landscape of sand, stone with some cacti, lobelias and proteas here and there. Then follows a desert landscape, followed by thick ice walls and plains with snow. You can see the mountain coming from the savage of the Kilimanjaro National Park from scratch, a breathtaking sight. It is also the highest single mountain in the world. There are more than seven starting routes, but only three routes leading to the summit of Kilimanjaro. These include the Umbwe route, Rongai route, Lemosho route, Shira Plateau route, Mweka route, Marangu route and Machame route. The time of departure depends on your arrival, preferably we leave early in the morning to go straight to the first cabin, you can also choose to stay in Moshi first, and then leave early in the morning to one of the starting points. During the ascent you will be served three meals a day, a breakfast (O) consisting of: tea, coffee, chocolate milk, fruit, bread, jam, peanut butter, honey, boiled or fried egg and sausages. A lunchbox (LB) consisting of bananas, sandwiches, cucumber, carrots, boiled egg and chicken. And the evening meal (AM) consists of: pre-soup, then pasta / rice / potatoes, salad, vegetables, meat / chicken and a dessert. When you return in the afternoon you will be served tea, coffee, chocolate milk with popcorn and cookies. Uhuru Peak, the highest point in Africa, 19340 ft !! We are confident that you will start climbing in good health, if there is something wrong with your health, or have happened (for example, heart problems), or if you are using medicines that carry a risk or that you can bring with you, please let us know. know your application. Your information will be treated confidentially. You can climb this mountain all year round, but the best periods for a trip are from December to April, and from June to October. 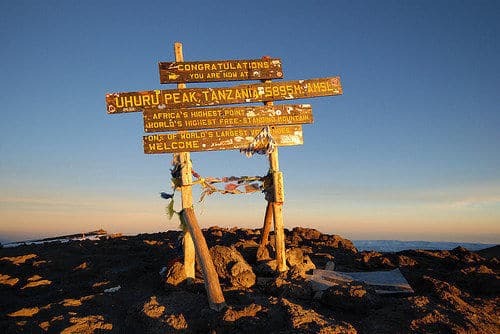 Anyone with good health, and a good condition can reach the highest point of Africa, with the help of his guide, carriers and possible fellow climbers! 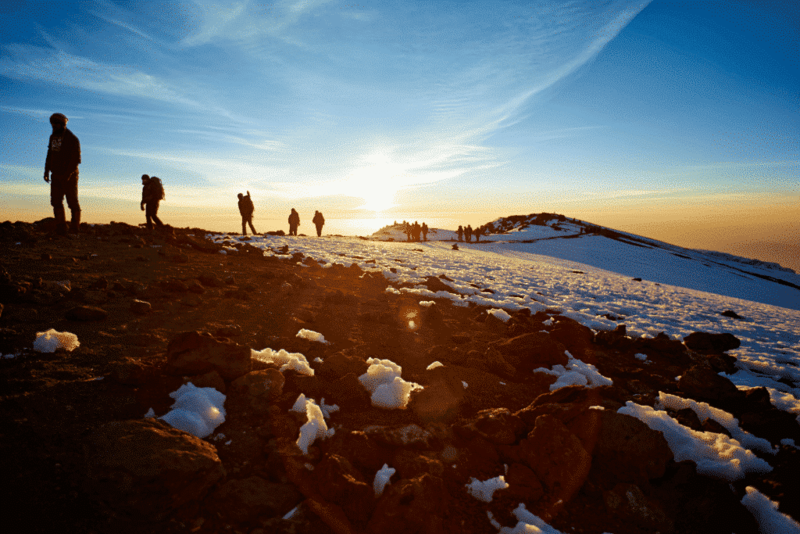 Do you want to know what the costs are for climbing Kilimanjaro? We are happy to provide you with a free quote of prices.